Granular parakeratosis, a benign condition, was first described in 1991 as a skin disease manifesting with erythematous hyperpigmented and hyperkeratotic papules and plaques of the cutaneous folds. Granular parakeratosis is sometimes associated with pruritus. Granular parakeratosis has been associated with excessive use of topical preparations, in particular antiperspirants and deodorants; however, it has been found in persons who have not used such agents. Granular parakeratosis in an 82-year-old man who developed this yellowish, scaly plaque at his left infra-axillary area after changing deodorants. Pathology confirmed granular parakeratosis. Courtesy of David F. Butler, MD. The etiology of granular parakeratosis is uncertain, but Metze and Rütten  defended the hypothesis, first proposed by Northcutt et al,  that a basic defect exists in the processing of profilaggrin to filaggrin, which maintains the keratohyaline granules in the stratum corneum during cornification. Because granular parakeratosis has been associated with excessive use of topical preparations, an occlusive environment, increased sweating, and, sometimes, local irritation, some suggest that it is an allergic contact or irritant reaction. Some patients who have manifested granular parakeratosis have not used topical preparations, and, thus, the causal linkage of granular parakeratosis to topical substances is unclear. In any case, the primary cause for granular parakeratosis remains unknown. Only approximately 40 case reports of granular parakeratosis have been published, but it is likely more common than the number of case reports suggests. Scheinfeld and Mones  reviewed the diagnoses of 363,343 specimens submitted to the Ackerman Institute of Dermatopathology in New York over a 5-year period. Eighteen (0.005%) of 363,343 specimens were diagnosed with granular parakeratosis. Scheinfeld and Mones  concluded that if the incidence of granular parakeratosis among biopsy specimens is representative of its general prevalence among persons with cutaneous eruptions, granular parakeratosis is rare. Only rare case reports of granular parakeratosis are noted, but it is probably not a rare condition. In 2002, Rodriguez  reported 3 cases of granular parakeratosis in women in Columbia. No racial association has been reported for granular parakeratosis. Granular parakeratosis has been reported in blacks and whites. Most reported cases of granular parakeratosis have occurred in women. Whether this finding represents a reporting bias or a real association is unclear. Northcutt AD, Nelson DM, Tschen JA. Axillary granular parakeratosis. J Am Acad Dermatol. 1991 Apr. 24(4):541-4. [Medline]. Niesmann J, Bierhoff E, Dirschka T. [Hyperkeratotic pruritic papules in the submammary area. Diagnose: Granular parakeratosis]. J Dtsch Dermatol Ges. 2010 Aug. 8(8):631-3. [Medline]. Leclerc-Mercier S, Prost-Squarcioni C, Hamel-Teillac D, Fraitag S. A case of congenital granular parakeratosis. Am J Dermatopathol. 2011 Jul. 33(5):531-3. [Medline]. Martorell A, Sanmartín O, Hueso-Gabriel L, Guillén C. [Granular parakeratosis: disease or reactive response?]. Actas Dermosifiliogr. 2011 Jan. 102(1):72-4. [Medline]. Channual J, Fife DJ, Wu JJ. Axillary granular parakeratosis. Cutis. 92(2):. 2013 Aug:61, 65-6. [Medline]. Metze D, Rutten A. Granular parakeratosis - a unique acquired disorder of keratinization. J Cutan Pathol. 1999 Aug. 26(7):339-52. [Medline]. Wallace CA, Pichardo RO, Yosipovitch G, Hancox J, Sangueza OP. Granular parakeratosis: a case report and literature review. J Cutan Pathol. 2003 May. 30(5):332-5. [Medline]. Hoste E, Denecker G, Gilbert B, Van Nieuwerburgh F, van der Fits L, Asselbergh B, et al. Caspase-14-Deficient Mice Are More Prone to the Development of Parakeratosis. J Invest Dermatol. 2013 Mar. 133(3):742-50. [Medline]. Scheinfeld NS, Mones J. Granular parakeratosis: pathologic and clinical correlation of 18 cases of granular parakeratosis. J Am Acad Dermatol. 2005 May. 52(5):863-7. [Medline]. Braun-Falco M, Laaff H. Granular parakeratosis--a clinical-pathological correlation of 10 cases. J Dtsch Dermatol Ges. 2009 Apr. 7(4):340-4. [Medline]. Rodriguez G. [Axillary granular parakeratosis]. Biomedica. 2002 Dec. 22(4):519-23. [Medline]. Brouwer MW, Kemperman PM. A female with axillary red-brown plaques. Br J Dermatol. 2013 Nov 9. [Medline]. Patrizi A, Neri I, Misciali C, Fanti PA. Granular parakeratosis: four paediatric cases. Br J Dermatol. 2002 Nov. 147(5):1003-6. [Medline]. Trowers AB, Assaf R, Jaworsky C. Granular parakeratosis in a child. Pediatr Dermatol. 2002 Mar-Apr. 19(2):146-7. [Medline]. Chang MW, Kaufmann JM, Orlow SJ, Cohen DE, Mobini N, Kamino H. Infantile granular parakeratosis: recognition of two clinical patterns. J Am Acad Dermatol. 2004 May. 50(5 Suppl):S93-6. [Medline]. Contreras ME, Gottfried LC, Bang RH, Palmer CH. Axillary intertriginous granular parakeratosis responsive to topical calcipotriene and ammonium lactate. Int J Dermatol. 2003 May. 42(5):382-3. [Medline]. Urbina F, Sudy E, Misad C. Two episodes of axillary granular parakeratosis triggered by different causes: case report. Acta Dermatovenerol Croat. 2012. 20(2):105-7. [Medline]. Pock L, Hercogova J. Incidental granular parakeratosis associated with dermatomyositis. Am J Dermatopathol. 2006 Apr. 28(2):147-9. [Medline]. Pock L, Cermakova A, Zipfelova J, Hercogova J. Incidental granular parakeratosis associated with molluscum contagiosum. Am J Dermatopathol. 2006 Feb. 28(1):45-7. [Medline]. Reddy IS, Swarnalata G, Mody T. Intertriginous granular parakeratosis persisting for 20 years. Indian J Dermatol Venereol Leprol. 2008 Jul-Aug. 74(4):405-7. [Medline]. Ezra N, Karunasiri D, Chiu MW. Unilateral pruritic axillary rash: axillary granular parakeratosis. Arch Dermatol. 2008 Dec. 144(12):1651. [Medline]. Akkaya AD, Oram Y, Aydın Ö. Infantile granular parakeratosis: cytologic examination of superficial scrapings as an aid to diagnosis. Pediatr Dermatol. 2015 May-Jun. 32 (3):392-6. [Medline]. Chan MP, Zimarowski MJ. Vulvar dermatoses: a histopathologic review and classification of 183 cases. J Cutan Pathol. 2015 Aug. 42 (8):510-8. [Medline]. Paradisi A, Sisto T, Annessi G. Groin granular parakeratosis. Eur J Dermatol. 2010 Mar-Apr. 20(2):242-3. [Medline]. Niesmann J, Bierhoff E, Dirschka T. [Hyperkeratotic pruritic papules in the submammary area. Diagnose: Granular parakeratosis]. J Dtsch Dermatol Ges. 2010 Aug 1. 8(8):631-3. [Medline]. Resnik KS, Kantor GR, DiLeonardo M. Granular parakeratotic acanthoma. Am J Dermatopathol. 2005 Oct. 27(5):393-6. [Medline]. Joshi R, Taneja A. Granular parakeratosis presenting with facial keratotic papules. Indian J Dermatol Venereol Leprol. 2008 Jan-Feb. 74(1):53-5. [Medline]. Genebriera J, Davis MD, Yang H, Borrowman TA. Papillomatous axillary rash due to granular parakeratosis. J Eur Acad Dermatol Venereol. 2007 Aug. 21(7):994-5. [Medline]. Brouwer MW, Kemperman PM. 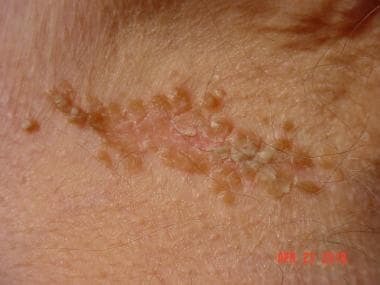 A woman with axillary red-brown plaques. Br J Dermatol. 2014 Feb. 170(2):479-80. [Medline]. Mehregan DA, Vandersteen P, Sikorski L, Mehregan DR. Axillary granular parakeratosis. J Am Acad Dermatol. 1995 Aug. 33(2 Pt 2):373-5. [Medline]. Resnik KS, DiLeonardo M. Follicular granular parakeratosis. Am J Dermatopathol. 2003 Oct. 25(5):428-9. [Medline]. Resnik KS, Kantor GR, DiLeonardo M. Dermatophyte-related granular parakeratosis. Am J Dermatopathol. 2004 Feb. 26(1):70-1. [Medline]. Resnik KS, DiLeonardo M. Incidental granular parakeratotic cornification in carcinomas. Am J Dermatopathol. 2007 Jun. 29(3):264-9. [Medline]. Yang JH, Lee HM, Noh TK, Won CH, Chang S, Lee MW, et al. Granular parakeratosis of eccrine ostia. Ann Dermatol. 2012 May. 24:203-5. [Medline]. Brown SK, Heilman ER. Granular parakeratosis: resolution with topical tretinoin. J Am Acad Dermatol. 2002 Nov. 47(5 Suppl):S279-80. [Medline]. Compton AK, Jackson JM. Isotretinoin as a treatment for axillary granular parakeratosis. Cutis. 2007 Jul. 80(1):55-6. [Medline]. Webster CG, Resnik KS, Webster GF. Axillary granular parakeratosis: response to isotretinoin. J Am Acad Dermatol. 1997 Nov. 37(5 Pt 1):789-90. [Medline]. Ravitskiy L, Heymann WR. Botulinum toxin-induced resolution of axillary granular parakeratosis. Skinmed. 2005 Mar-Apr. 4(2):118-20. [Medline]. Samrao A, Reis M, Niedt G, Rudikoff D. Granular parakeratosis: response to calcipotriene and brief review of current therapeutic options. Skinmed. 2010 Nov-Dec. 8(6):357-9. [Medline]. Patel U, Patel T, Skinner RB Jr. Resolution of granular parakeratosis with topical calcitriol. Arch Dermatol. 2011 Aug. 147:997-8. [Medline]. Ozkanli S, Zemheri E, Karadag AS, Akbulak O, Zenginkinet T, Zindanci I, et al. A comparative study of histopathological findings in skin biopsies from patients with psoriasis before and after treatment with acitretin, methotrexate and phototherapy. Cutan Ocul Toxicol. 2014 Sep 29. 1-6. [Medline].